Shakespeare Birthplace, Stratford-upon-Avon, Warwickshire, CV37 6QW. If you are a Japanese person you have to be photographed outside the main Shakespeare Birthplace in Stratford-upon-Avon, that’s just one of the things you do on your world tour. Once awash with American tourists the house and the town now sees fewer folk from the USA but it is still a tourist Mecca for many thousands of other visitors. The museum itself is interesting but the actual house is so artificial (although recently renovated) that you cannot imagine anyone ever living there let alone the most famous bard in the world. 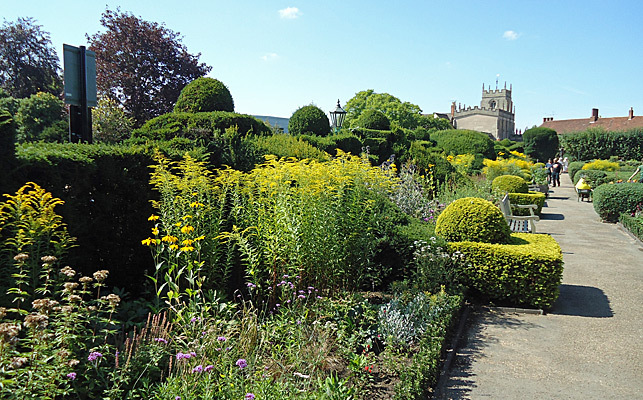 Still the gardens are suitably seventeenth century in inspiration and worth a photograph or two for those looking for something quintessentially English with a bit of Box. 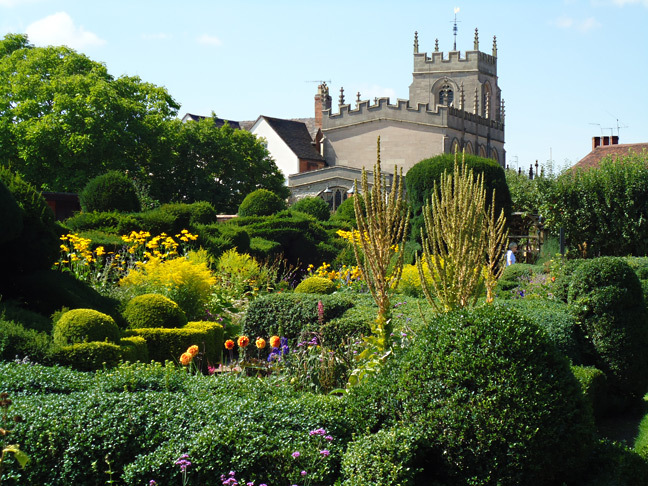 Shakespeare’s father was a civic worthy in the town and may have had a formal garden and indeed there are many references to formal clipping in the “complete works” so it is something he would have been familiar with in the wider world. New Place was once the home of William Shakespeare as an adult and it is is a leisurely tern minute walk from the Birthplace. There is not a lot left of the house. The plot where it once stood has been excavated by archaeologists in time for the 500th anniversary and the gardens have been extensively renovated. 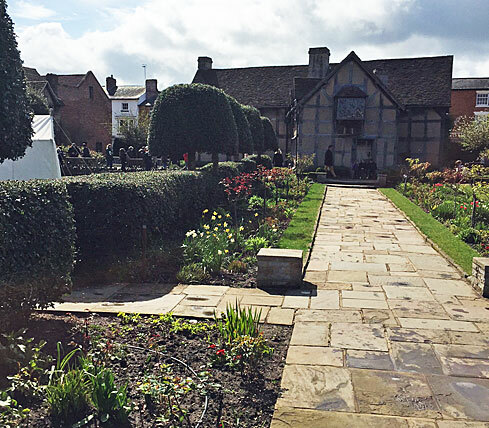 The limits of the house have been cleverly marked in the floor of the new gardens and you can see the original well as well as clever sculptures such as Shakespeare’s desk. The gardens were once upon a time public gardens and free although there is now a charge to cover costs. Nonetheless they are definitely worth a visit for the topiarist. Mature yew hedges abound and there’s a lovely monument to William himself in the corner. Its just a few minutes walk from the Royal Shakespeare Theatre on the river but I wonder how many theatre goers actually wander up the narrow side street leading towards the town centre to see it although it is now more heavily marketed than it once was. 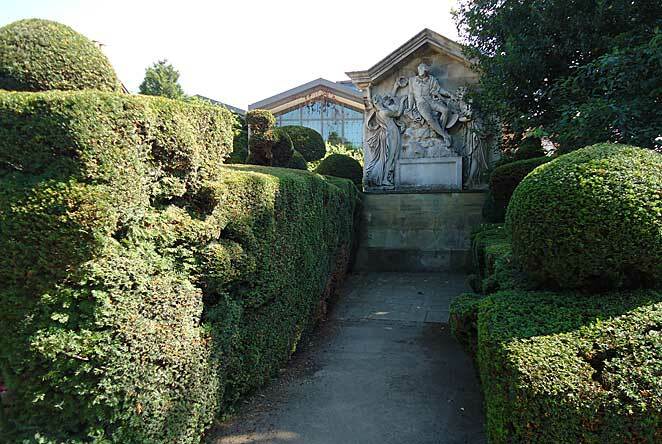 The side borders are incredibly well maintained by the gardeners of the Birthplace trust and they are set off by mature yew hedging which bounds the street. 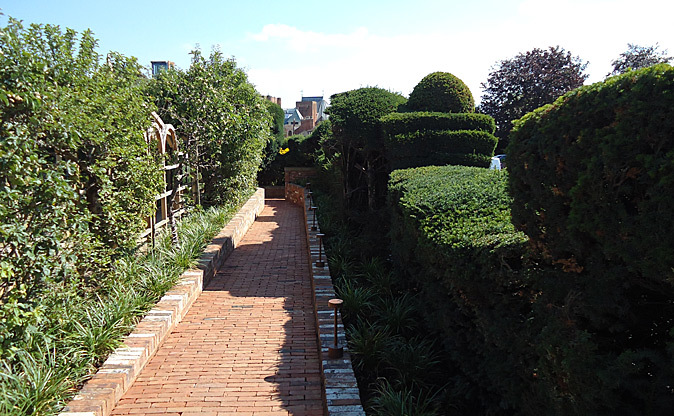 You will walk through the modern additions before you get to this original section which is called the great garden. This is a fantastic spot for a picnic if you have children in tow. Although the trees donated by benefactors are still there this section has been enhanced by a series of sculptures featuring characters from (you’ve guessed it) Shakespeare plays. They are free flowing and organic which suits the garden well but you will probably find yourself having to look at the labels to find out who they actually represent. The original Shakespeare memorial plinth still remains but there are also other additions in this section to keep the children amused or to interest the Shakespeare buffs. There is a fine new knot garden near the buildings at the entrance. You can view this before the great garden, it is up to you which order you take things in. 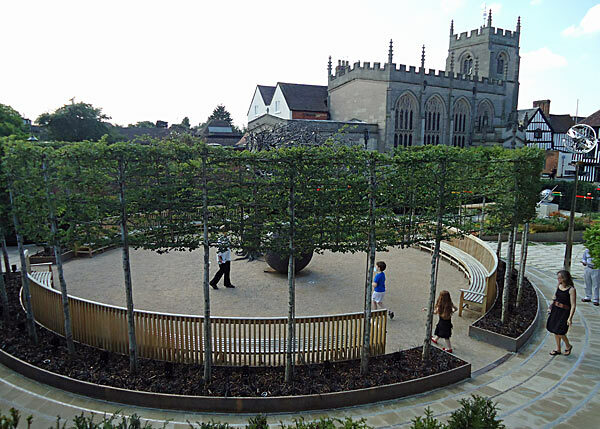 Naturally the planting is using only authentic shrubs of the time of Shakespeare and there are several levels from which you can look down to get the full effect. Incidentally you exit the gardens via a new museum next door which takes you upstairs to a magnificent outdoor viewing platform so take your camera or camera phone. Of course, as befits the academics of the Shakespeare Birthplace Trust, this is a proper knot garden. i.e one where the low hedging is made up of different plants and is cut so that it looks as if it is interwoven like string in a loose knot would be. 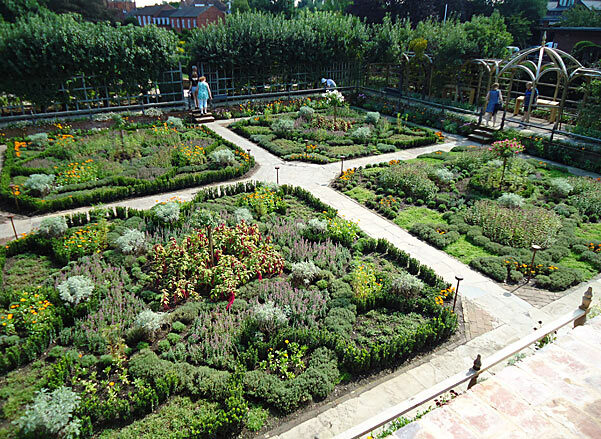 The terms knot garden and parterre are therefore not interchangeable. You will finally descend into the New Place shop. (Something has to subsidise the Shakespeare Trust). Don’t try to gain entrance from here as the entrance is further along the street through the garden gate. In general the new, such as the circular area with pleached limes with a sculpted tree at its heart complement the old sections perfectly. One slight word of warning is that you cannot get a ticket just for New Place. You must buy a ticket that covers the Birthplace as well but the good news is that this lasts you up to a year so there is no need to visit all the properties on one day. I would thoroughly recommend at visit to the lovingly restored New Place gardens and museum.